These cushions are the perfect safeguard against troublesome bunions. 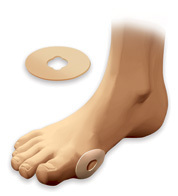 The extra soft Hydrogel bunion cushion brings about instant relief of the affected area, redistributes lateral shoe pressure, and avoids insidious friction. This hypoallergenic cushion comeswith a central cut out for easy accommodation of the subluxated first joint. Package contains two bunion cushions.